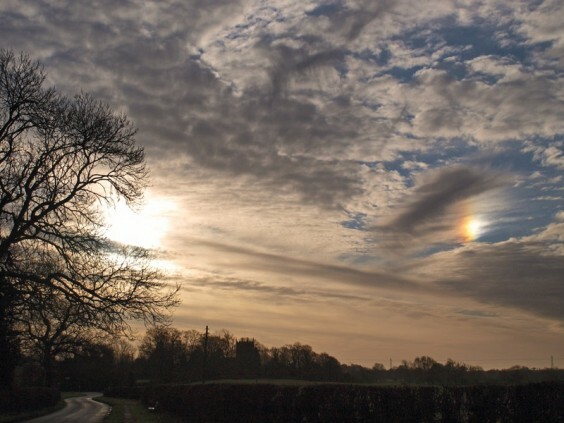 Rare sight: Phil took this picture over Studley of a ‘sundog’ rainbow effect in the cloud and a ‘fallstreak hole’ (also known as a punch hole cloud) where a large circular gap forms in cirrocumulus or altocumulus clouds when the water temperature in the clouds is below freezing but the water has not frozen due to a lack of ice nucleation particles. After one of the coldest Decembers for many years, January didn’t produce much in the way of exciting weather. There was a cold start with a change around the 10th, a very mild period for 7-10 days and then back to a cold dry end to the month. February to the 14th has continued in the same theme, in fact being much milder than average so far. Looking further ahead is always difficult but there is always a chance of some cold and snowy weather at any time during March – although the forecast seems to be much of the same, mild with some chillier spells.